America may be fractured on a number of issues these days, but there’s one thing we can all stand behind: Pancakes are delicious. On March 8, we celebrate this fine breakfast food (that sometimes works just as well for other meals) on National Pancake Day. It’s a day that’s largely identified with IHOP, though other restaurants have gotten in on the action as well. IHOP – This is ground central for free pancakes. The chain hands out a complimentary short stack of buttermilk pancakes to anyone who wants one from 7:00 a.m. to 7:00 p.m. It’s also the company’s biggest philanthropic effort of the year. Guests are encouraged to donate what they would have spent for that meal to the Children’s Miracle Network Hospital. If they make a donation of $5 or more, they’ll get a coupon good for $5 off their next visit. That’s basically two meals for free for a token charitable donation. And in Chamblee, Ga., IHOP patrons could have their pancakes made by Miss America. Denny’s – Denny’s doesn’t formally recognize National Pancake Day, but it’s not going to cede the day’s breakfast business to IHOP. The chain is offering 20% off a party’s entire check with this downloadable coupon. Peet’s Coffee & Tea – Once again, you’ll need to print a coupon, but the chain that predates Starbuck’s is offering half off of any beverage between noon and 5:00 p.m. now through March 9. And there’s not much that goes better with pancakes than a piping hot cup of coffee. 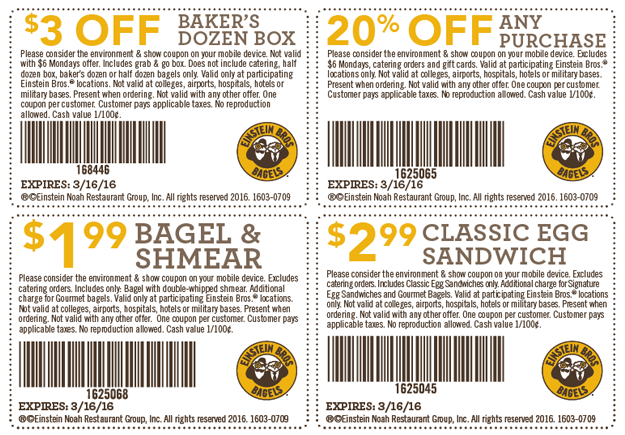 Noah’s New York Bagels/Einstein Bros. Bagels – Prefer your breakfast starches a bit more portable? These two bagel chains (which are owned by the same parent company) are making it a little cheaper. Both have coupons offering 20% off of your purchase. The Noah’s coupon expires on March 8, while Einstein Bros. gives you until the 16th to get a schmear.